I thought it would be nice to post who my ancestors are and where they were from and maybe, like some of you, I might find relatives. Remember, I was adopted, so this is why I have so many branches in my family and this doesn't included my non-Italian side. If you are related, contact me, I have tons of information to share. The Testa, Damiani, and Piccoli families were from Isernia. The Quaresima family from Capua. The DeCurtis was from Civitanova del Sannio. The DiIorio, DiSipio, Paolucci, Mascitelli, Michelli, D'Angelo, and Cirotti families from Rapino. The Presenza, Neri, Palidoro, and DiPaolo families from Torino di Sangro. The Tartaglia, DeAngelis, DeRe, Tesone, Saraceni families from Pollutri. Tedesco, Tropiano, DeFrancesco, and Spano families from Santa Caterina dello Ionio. Varano, Coroniti, LaCroce, Mirarchi, Procopio, and Pupo families from Isca Sullo Ionio. Do you happen to have anything about Antonia di Stefano( born around 1795), the first wife of Nicola Vacca (1790)and mother of Michelangelo Vacca, born May 6, 1824? They resided in Castlapetroso, but I canÃ‚Â´t find any other connection to Antonia di Stefano. I'll have to get back to you on the DiStefano. I'll keep you posted. However, my g-grandfather was Pasquale DeStefano (diStefano) and his father was Emilio DeStefano (distefano). Pasquale came to the USA and married Teresina Vecchiarelli. They lived in Philadelphia, Pennsylvania. Thanks......I do have an Alessandro Cifelli in my database born @ 1879. However, he was born in Sant'Angelo in Grotte and his father was Giacinto. 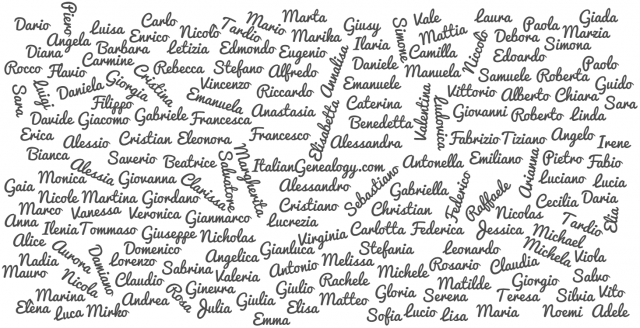 Any references to Martino Cifelli & Serafina Cicchino (early 1700's) or to possible children of theirs would only show up in extracts of parish records included in marriage processetti of their descendants. I have to apologize! With the holiday just passing by and having work done to my home, I'm not able to get to all my records to try to verify things with you. Please be patient with me for a bit. Here's some information just off the top of my head. Teresina Vecchiarelli (1885-1967), parents are Nicolantonio Vecchiarelli and Giovanna DeFrancesco. Pasquale and Teresina are my great-grandparents. As to the ancestors, I have to get back to you once I can get to my computer and my information. You can always email me directly at brujaojos@yahoo.com. My Tedesco come from Santa Caterina della Ionio in Catanzaro, Calabria. So I guess we aren't related, but thanks for looking at my post. BTW, are you open to posting threads like this for each of us? I'd like to get more connections, myself. Start a new post and list your family. I know I've made connection by doing it.